First we uncovered the secret behind the Silo – the secret that explains the present. But what will we find if we dig further? What will be revealed when we go back to the start of it all? 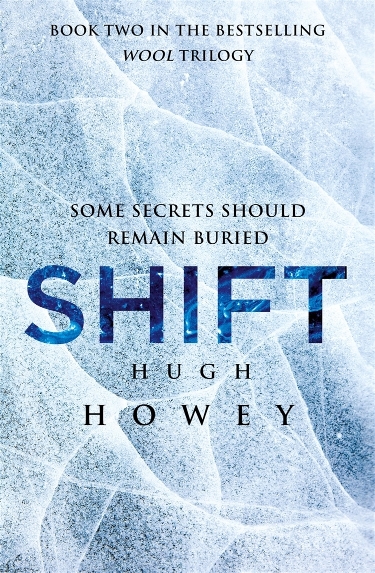 Shift is the second book in the Silo trilogy and the prequel to Wool, a best-selling novel that I reviewed very favourably in 2012, (click here for my review). Where Wool landed us in a post-apocalyptic present and slowly revealed a devastating reality, Shift takes us back to the pre-apocalyptic past and replays the start of an horrific dynasty. The novel is divided into three parts – or “shifts”, spanning hundreds of years. Our key shift worker is Troy and we follow him as he acclimatises to life in the Silo and his gradual understanding of who he is and how he is. The apocalypse has passed. Interspersed with our introduction to Troy is the revelation of how the apocalypse came to be. Having read Wool, this was a back-story I was very interested in. Threats, paranoia and politics feature as expected, but also some new technology is introduced. It’s this piece of technology that starts to give shape to the entire trilogy, and it’s at this point I realised the author needed to step backwards in order to move forwards. But our review of pre-apocalyptic history doesn’t reveal all of the secrets to be found in this novel. There are “plans within plans” that gradually surface over the course of the three shifts. Some cast a new light on events and phenomena encountered in the previous book, while others help to set up the premise for the final book of the trilogy. Not satisfied in merely fleshing out a background to the idea of the Silo, the author also relates the stories that lead up to and even run parallel to the story of Wool. To me, this was the most satisfying element of the novel. It gave the original story more life and more excitement when played out from a fresh perspective. While reading the third shift, I was experiencing that familiar excitement and awe that gripped me during the first novel. I wasn’t completely impressed with the choices the author made in constructing this post-apocalyptic world. The technology introduced was interesting, but how it was used didn’t always gel with me. Additionally, the setting of the stage for the final book was almost too obvious. I’m sure there will be some exciting revelations to come, but I can already see the path quite clearly which perhaps robs the next novel of a few early reveals. Reservations aside, the risk the author took to relate interlocking stories with the first novel showed some courage. It was quite possible for the attempt to have actually lessened the value of the story told in Wool. However, in my mind, the effort enhances rather than detracts, weaving gracefully and seamlessly between the lines of the first story. Troy is definitely the main character and luckily, a very worthwhile one. I really enjoyed the experience of seeing the Silo through his eyes and walking the corridors in his shoes. I’m always impressed when an author chooses to give the protagonist a few shades of grey, and Troy presented an interesting study. Vulnerability blends with determination; pragmatism with idealism. And not all acts and choices seem humane. The supporting cast are not really fleshed out in their own right as we see them primarily through the eyes of Troy. However, one of the aspects of the novel that I enjoyed is the idea that the “baddies” are not actually evil. I felt the previous novel hinted at this and Shift takes this a step further. The actors all demonstrate both selfishness and a brand of altruism along with a willingness to do what is required for what they believe to be right. Perhaps this is one of the reasons I’ve been so impressed with the world that the author has created. I find that instead of pointing my finger in blame, I end up wondering how I would cope with that kind of knowledge, that responsibility. At the end of the novel, I don’t necessarily feel that Troy’s decisions are righteous, just that they will change the path originally set. The writing is fluid and capable, which in my second experience with this author was fully expected; I would have been disappointed if it proved otherwise. While I wouldn’t call the effort poetry in prose, it achieves exactly what it needs to achieve without flourish, but also without fault. Even acknowledging the few qualms I have with plot choices, I am sold, sold, sold on the world Hugh Howey has created. It is terrifying, riddled with moral ambiguity and mirrors current reality more than its exaggerated vision initially suggests. I’ll be there for the third novel and I already have the rest of his catalogue in my sights. This entry was posted in 4.5, Novel, Reviews, Science Fiction and tagged Post-apocalyptic, Science Fiction, Thriller. Bookmark the permalink.